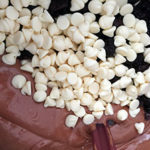 Looking over the recipe, a take on the chcolate-cherries-and-cream that spells Black Forest from Matt Lewis’ and Renato Politafito’s “Baked: New Frontiers in Baking” (2008), I was easily sold and changed my plans. 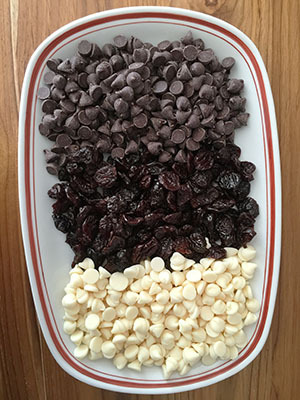 A rich, chocolatey drop cookie, loaded with semi-sweet and white chocolate chips, along with tart dried cherries, looked fairly simple, and very yummy. 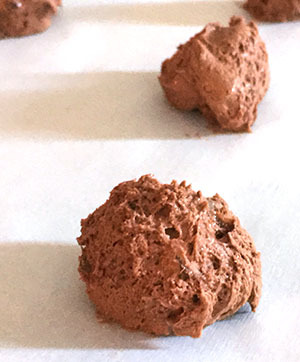 The most complicated aspects (which really were not all that complicated), were the steps of melting chocolate and allowing a good long chilling time for the finished cookie dough. 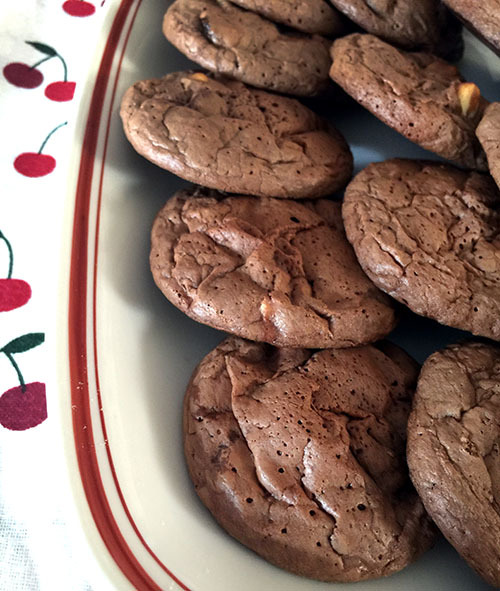 I used to make so many drop cookies, I was eager to make this one. And a bonus: I already had all the ingredients on hand! 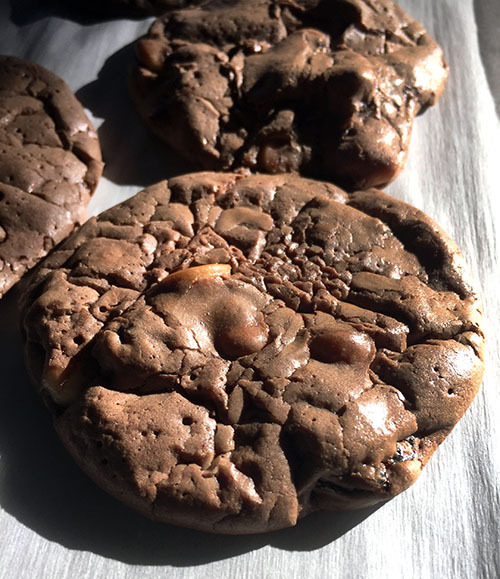 In melting the chocolate and butter for the recipe, I defied the “double boiler” method and melted everything in the microwave, heating in 30-second increments. I appreciate the low-and-slow stovetop method, but I find the microwave works just fine for many things as long as you don’t heat too much (this pound of chocolate and 10 tablespoons of butter ended up taking under less than a minute and a half). 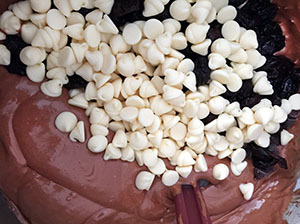 This batter (and I call it that because it really is more like a thick cake batter before chilling) comes together in a flash, once a high number of eggs (6), and brown and white sugar are whipped to pale voluminous froth, then the cooled melted chocolate is added and finally a combination of flour, baking powder and salt. Following minimal mixing, the chips and cherries are folded in and and the creamy and irresistible (I did dip a finger in) batter is chilled for at least six hours (I did mine overnight). The batter firms up, but is still somewhat soft (and is a soft cocoa color). Scooping was a little sticky (sometimes spraying the scoop with baking spray will help, but re-spraying is required), but still worked. Even though I was using a tablespoon scoop as instructed, I ended up with A LOT more cookies than the recipe’s estimated yield of 24 (I wound up with more like 40). This is NOT a complaint (who would complain about MORE cookies? ), just a remark on a variance. I was actually delighted I ended up with more. 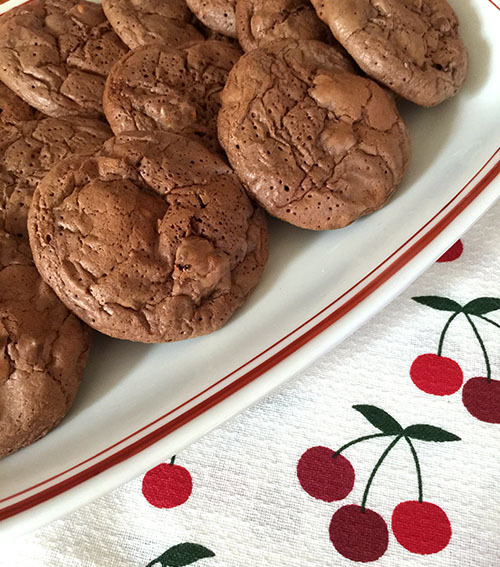 These cookies are so very delicious — soft, but delicately chewy, slightly crusty on the outside and deeply dark on the inside with delightful bursts of darker chocolate, gently sweet white chocolate and those tarty cherries. With treats like these, making more time for cookie-baking — and less for anything else — seems more than obvious.